Kafanchan, Nigeria (CNN) ? Dead bodies littered a road in northern Nigeria on Sunday after a massive explosion that an official said killed 25 people and a witness said shattered windows of a nearby church where worshipers were celebrating Easter. Abubakar Zakari, a spokesman for Nigeria?s State Emergency Management Agency, said that ? in addition to the dead ? 13 wounded people were rushed to a hospital for treatment. The blast occurred in Kaduna, a city located about 230 kilometers (140 miles) southwest of Kano, around 8:40 a.m.
At that time, Sam Amoka said he was inside All Nations Christian Assembly when he heard a loud blast and saw the church?s windows break. 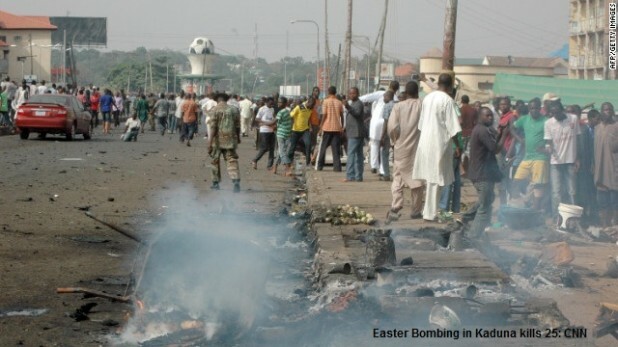 The bomb itself went off nearby, close to Kaduna?s stadium, a bus stop and a spot for street salesmen, Amoka said. At the bomb site, Amoka said he saw dozens of bodies lying in the road. The target of the explosion was not immediately clear. There was another explosion Sunday in the central Nigerian city of Jos about 250 kilometers from Kaduna, said emergency management spokesman Yohanna Audu. Audu said there are no known casualties in that blast. The bomb went off around 9 p.m. in the busy commercial center of Jos, near a popular drinking spot and school, resident Mike Dishing said. Security officials subsequently cordoned off the area, he added. There have been numerous instances of violence in recent months in Nigeria, including many targeting Christians. That includes a car bomb attack last month outside a Catholic church in Jos that left six dead, according to hospital and government officials. And on Christmas Day, a string of bombings struck churches in several cities. In his Easter Mass message on Sunday, Pope Benedict XVI referenced Nigeria among other African nations. ?To Nigeria, which in recent times has experienced savage terrorist attacks, may the joy of Easter grant the strength needed to take up anew the building of a society which is peaceful and respectful of the religious freedom of all its citizens,? the pontiff said. this is an appeal to FG...pls these murderers (boko haram) shld be eliminated from dis country........do all u can as a government to get dem ridden off. ?5 killed in fresh Kaduna attack by the Boko Haram sect to bomb some churches in the South-East, South- South and South-West geo-political zones during the upcoming Christmas and New Year celebrations.